The big launch!! 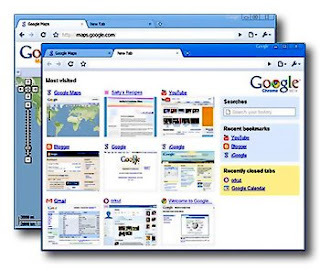 Google’s very own web browser to compete with the likes of Internet Explorer and Mozilla Firefox! Released yesterday, I downloaded my copy this morning and have just one word for the Beta Version- Wow! You’ll love it from the moment it starts. For beginners, it copies all your major settings from Mozilla Firefox / Internet Explorer, like your bookmarks, your password settings among others, so you don’t need to waste an hour or so configuring it to your needs. At first look, it looks a bit blank and simple, just like the Google Website. But don’t get fooled by the looks. The speed is 3X compared to what Firefox gave me and 5X to IE! Once you start using it often, it shows the web pages most often visited by you on the right side as soon as you open Chrome! The bookmarks are there as well, making navigation difficulties a thing of the past! Adding and editing bookmarks is similar to the function in Firefox. 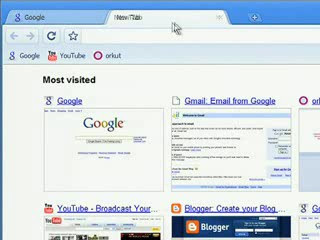 Its the best Browser for Gmail (and other Google services) users! No crashes in Gmail! The Gmail and Orkut pages would hang or at least slow down my old computer ever so often, but Chrome’s got no such issues! And there always is a guarantee that this is a product from one of the best software industries in the world. This one is going to be a giant killer in the web browsing market! Google took 1 year of research work to finally come up with this BETA Release. Microsoft and Mozilla beware! This thing is going to be the next big thing! Already creating ripples in the virtual world, Chrome was a silent release (unlike the hyped Firefox 3.0 release, which I didn’t find much different from Firefox 2.0), but I guess its not got even one rotten review so far! Go for it, you wont regret it! That Firefox update can wait guys! Got the Sony Bravia LCD TV! This was due for a long time and finally, last week, we got it! 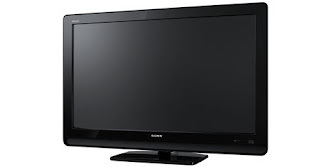 The 32″ Sony Bravia LCD TV! The model name is KLV-32S400A from the Bravia ‘S’ Series. The sleek look and the features made me fall for it and i knew at that very instant, if we were to buy one, it would be this one! The features now. It boasts of the HD Tech and the Bravia Engine 2, which incorporates full digital signal processing technology in all high-quality image processes, maximizing the features of display devices and producing life-like images. The fully digital video-processing circuit can reproduce optimal, high-resolution images from SD signals and HD signals. The Dynamic Contrast Ratio is 15000:1 and the panel contrast is 1800:1. The display resolution is a healthy 1366 x 768. Among other Audio capabilities, its got good surround sound tech and looks good on a wall-hanging! Love this thing and the first major experience is watching footballing action on it! What a difference from the previous 20″ TV!! Feels like those giant screen telecasts compared to them..! Whoa! A very good buy indeed! In short, The Bravia Series sure lives up to the expectations..!! Cheers!